I have been interested in astronomy since I can remember. As a very young boy I used to gaze up at the night sky and wonder how it all fitted together. That puzzle didn’t start to unravel properly until the age of 9 when I suddenly “discovered” The Plough for myself. Once I had a start on the sky I gradually learnt my way around the visible constellations and learning the positions of all the “Celestial Lollypops” like the Messier objects. I started observing with some old 10×50 binoculars gradually moving onto a small refractor bought by my parents for Christmas. Living in North London I first met other kindred souls at South West Herts Astronomy Society but the distance of their meetings and being too young to drive, meant I could only attend a few meetings. One look at Saturn through their large reflector had me hooked even more. I was also a member of Hampstead Scientific Society for a while and was an assistant at their observatory on the heath using a fabulous 6″ Cooke refractor. From my time here I learnt a lot from other members. As a teenager my attention was directed elsewhere but my interest in astronomy was rekindled in 1985 when, as a newly married man and with my daughter well on the way, Halley’s comet returned and I bought my first serious scope, a 3 inch refractor. In 1987, tired of observing all on my own, I established the Bedford Astronomical Society where I built some wonderful friendships. It has been a successful and flourishing society ever since. I am also a member of Northampton Natural History Society and am involved in organising their events. I was Editor of the Handbook of the Federation of Astronomical Societies for a few years and was elected a Fellow of the Royal Astronomical Society in 1996. I have been the lead astronomer for Hale-Bopp and Aurora flights for members of the public. I have a degree in Biology, also training as a science teacher, obtaining a Post Graduate Certificate in Education. I am currently working as an IT Administrator, also dabbling at times in my old role as a Research Scientist for a small diagnostics company in Thurleigh, Bedfordshire. I spend a lot of my spare time observing and imaging, when clouds allow. When they don’t allow, it gives me time to hone my skills using software to get the most from my hard-earned images. My wife and I enjoy travelling and we have been fortunate enough to enjoy amongst other things seeing exotic wildlife in The Galapagos Islands and the life-changing experience of petting Gray Whales in calm, warm sea-water lagoons in Mexico. Both locations a naturalists and photographers paradise. The darkness of the night skies in the Sea of Cortez were also fantastic. A trip to Iceland enabled us to see the fantastic volcanic landscape as well as the northern lights in all their glory. I have established my own permanent observatory where the convenience of opening up and almost instantly observing makes the hobby even more enjoyable and convenient. Unfortunately living where I do provides me with a constant battle against the scourge of light pollution. Two street lights that shine directly into the garden give me lots of grief. But I am still amazed at times how much I can achieve, even with these obvious limitations that drive other observers / imagers to give up. I have written articles for many of the British astronomy publications and supplied images to illustrate astronomy articles for photographic magazines. I have also appeared regularly on local radio discussing many different aspects of astronomy. In 2013 I was proud to have my first astronomy book published by Springer. I also give talks and presentations on astronomy and space flight to schools, social groups, youth groups and astronomical societies or anyone else who is interested in finding out more about the night sky and am a STEMNET Ambassador. I have also organised a number of Astronophotography Workshops and hosted an evening to celebrate Tim Peake’s Principia Mission to the ISS. 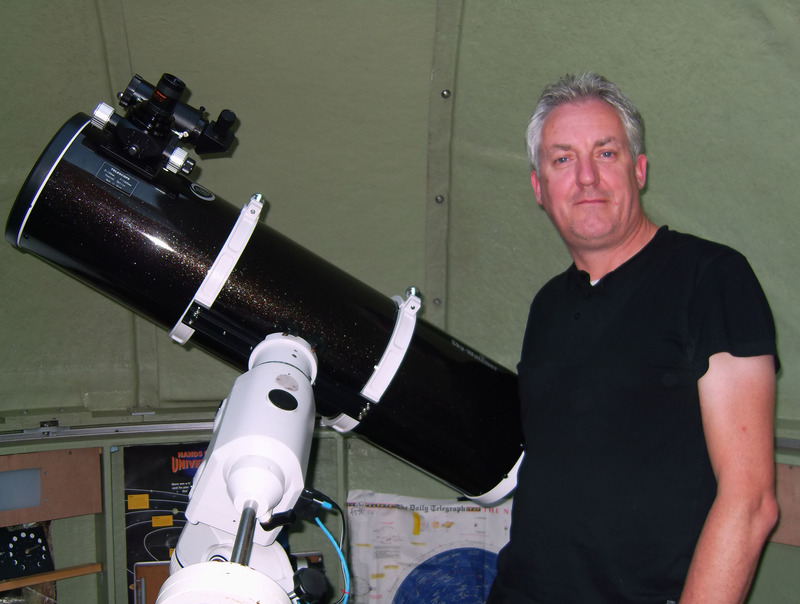 I am also an astronomy and astrophotography tutor for Adult Education for Northamptonshire Council. Not only restricted to astronomy, I also have wildlife and photography presentations that I give to other interested groups. I can organise a trip to schools with interactive sessions and seeing the Sun in Hydrogen Alpha light and decorating and launching fizzy-pop bottle rockets. I especially enjoy trying to get others to get out and appreciate the sky and all its wonders under a clear sky. I can also organise these for your social group or school. Astronomy like all hobbies should be fun. So get out in the fresh air and enjoy it. Eagles Eye On The Sky.